The Specialists Post Anesthesia Care Unit (or PACU for short) is staffed by a team of nurses, anesthesiologists and support services who are specifically trained to deal with the unique needs of the pre and post op surgical patient. Take account of your surgery, as well as, your current and past medical history that he/she has received from the Specialists Pre-Admissions/Lab and your surgeon’s clinic. Your PACU nurse will also make sure you that you are free of makeup, jewelry, contact lenses; if you wear dentures, hearing aides or glasses, your nurse will ask you to have your protective cases to place your items in prior to going back to surgery. Completing any additional orders from your doctor. 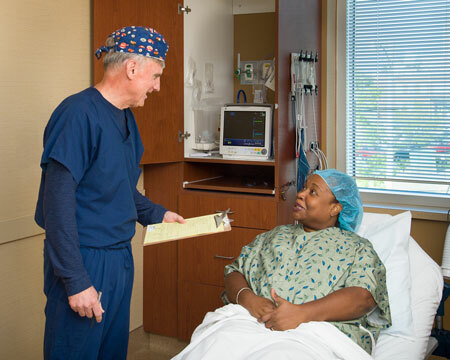 Your anesthesiologist will also go over your medical information with you and discuss any pain blocks and whether you will undergo general anesthesia. After surgery, you will return to the Specialists Post Anesthesia Care Unit (PACU). The PACU staff cares for patients recovering from general, local or regional anesthesia. You will remain in the Post Anesthesia Care Unit for approximately 30 to 90 minutes. The length of time depends on the type of anesthesia you have along with how quickly your body and mind become alert as the medication wears off. Because you will be drifting in and out of a very sleepy state, it may feel like you only spent a few minutes in the PACU. Visitation in the PACU is at the discretion of the nurse and physician caring for you a varies depending upon your procedure. You should discuss this with the nursing staff. Depending on what type of surgery –outpatient or inpatient will determine whether or not you go home after leaving PACU or if you will be transferred to the Specialist Inpatient Unit. Please note that if you are undergoing an Outpatient Procedure, the PACU nurse may only release you if you have a loved one that will be able to safely drive you home and assist you during your recovery after home. Your pacu nurse will instruct you and your loved one about any prescription medication or post- operative equipment you will require prior to being released. If you are undergoing an Inpatient procedure at Specialists, your PACU nurse is preparing you for transfer to the Specialists Inpatient Unit. When you are stable and breathing on your own, your PACU nurse will send a report to the nurses on the InPatient Unit and you will be transferred accordingly.